Spatial thinking is one of the most important skills that students develop as they learn geography. 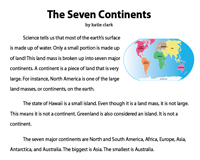 Develop awareness of the physical features of Earth, and knowledge of boundaries with this assortment of worksheets on the seven continents of the world designed for kids of grade 1 through grade 5; featuring 7 continents chart, flashcards, continent fact cards, and activities like identifying, coloring and labeling the continents, completing the legend, matching countries to continents, continent research projects, crossword, riddles, reading comprehension to mention a few. Bring in a globe and spark curiosity. This captivating chart is sure to grab the attention of kids and assists them in identifying the continents and learning their names and spellings with ease. Kids remember pictures better than words. Increase the recalling ability of kids by adding the name alongside the continent. 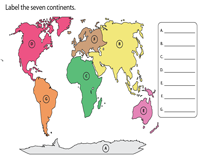 Cut along the dotted lines and create these continent flashcards. Incorporate this anchor chart or cut out individual units of each continent, comprising interesting snippets of information and facilitate active recall. Enhance memory with repetition of names and facts. 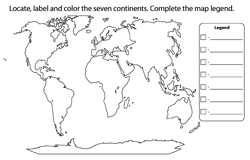 Familiarize kids of grade 1 to figure out the seven continents on the world map and color each one following the color key provided. Kids learn a vital skill of locating places on a map. 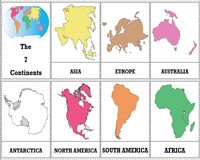 Equip kids of grade 2 and 3 with this label the continents worksheet and work on recognition tasks. 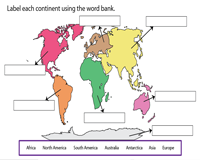 Kids use the names of continents presented in the word bank to complete the labeling activity. Each continent is marked and depicted with a letter. Instruct grade 3 and 4 kids to identify the continent and write its name against the letter that represents it to complete this evaluation activity. Engage and motivate elementary school kids with this worksheet. 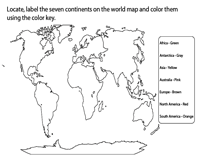 Direct kids to identify and label the continents and color them using colors of their choice and practice completing the legend or key as well. 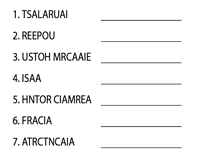 Hone spelling skills with this unscramble-the-continents worksheet. Use the trial-error method, rearrange the letters to unscramble the names of the continents and number the continents on the map. This easy-to-solve puzzle improves thinking and processing time in grade 3 kids. 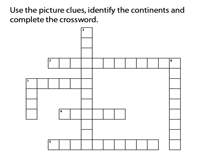 Build observation skills and vocabulary as kids look at the picture, identify the continent and write its name in the continent crossword grid. 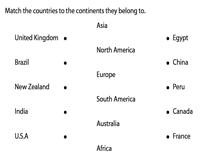 The countries are listed in one column and the continents in the other. Which continent does this country belong to? Answer this question and draw a line from the country to the continent and connect them. 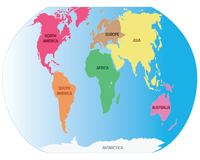 Read important facts about the continents and identify the continent described. Make one-to-one correspondence between the continent and its description using this continent matching activity PDF. Listed out in this fill-in-the-blanks worksheet for grade 5 children are the main points for recapitulation. Read each sentence carefully and plug in the missing word(s) from the word bank. Grade 4 and 5 children become aware of how to solve riddles by reading the clues that are written describing the continents and guess the name. Review interesting facts about the continents in the process. Travel the seven continents, explore and dig deeper to find out some special facts about each continent. 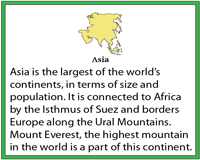 The questions in the template help children of grade 5 to research and find out the facts pertaining to each continent. Promote reading habits with this passage on seven continents. Follow-up with post-reading questions to encourage classroom interaction and assist kids in reading, enjoying and appreciating the text.